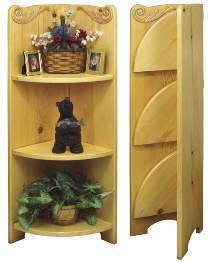 Lift the hinged shelves up and fold the hinged sides together for compact storage. The widest piece is 11” so you can make the entire project from 1x12 stock without the need for edge gluing. All parts drawn FULL SIZE. Measures approximately 38”H x 16”W x 11-1/2”D. Order a pair of embossed birch ornaments, ten hinges and screws separately below.